I was doing some file management this morning on my pictures and came across these pictures of the Irish Cream cheesecake trifles I made for New Year's Eve. I had planned to share the recipe earlier this year, but life got in the way. This dessert will be perfect for St. Patrick's Day. It really works any time of year, so make it and enjoy! It has become a tradition for my brother to host a dinner party on New Year's Eve for which I usually contribute the dessert. This very special dinner party consists of four or five courses, each paired with a carefully selected wine. The challenge for me as the dessert planner is selecting a dessert that tops off the meal without overwhelming. After all those courses, the guests will have very little room for dessert. 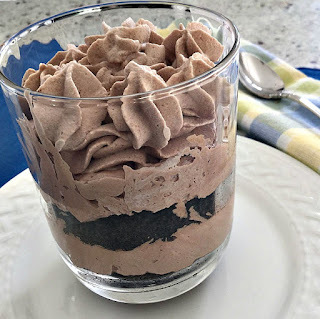 I wanted a dessert that could be prepared in individual servings and chocolate always seems to be a winner. 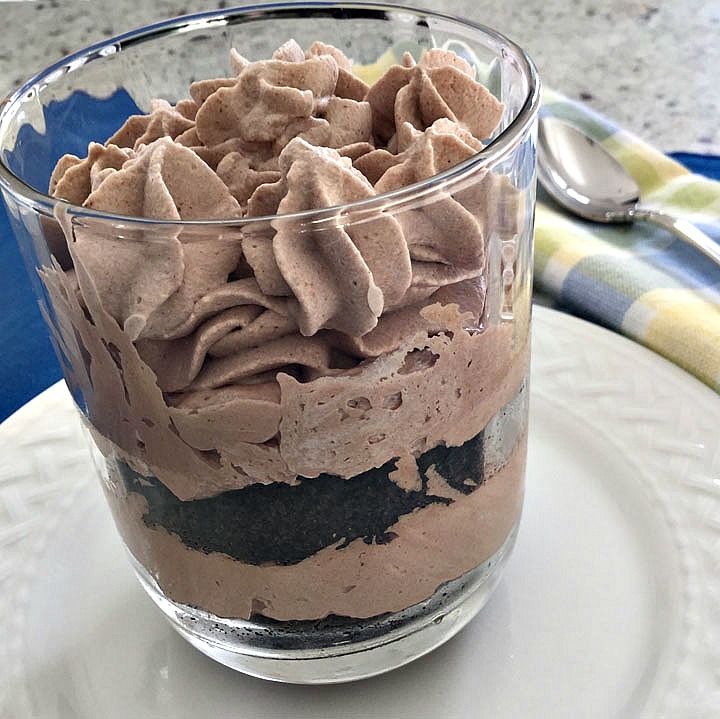 This Irish cream trifle fits the bill on both counts and adding the Bailey's Irish Cream flavoring adds a festive flair. Complicating my dessert choice was the fact that the dessert would need to be made in advance and transported to the dinner. I was confident the Irish cream trifle would travel well but was concerned that the whipped cream topping would not. Whipped cream toppings are delicious on desserts, but regular whipped cream will collapse if it is made too far in advance. 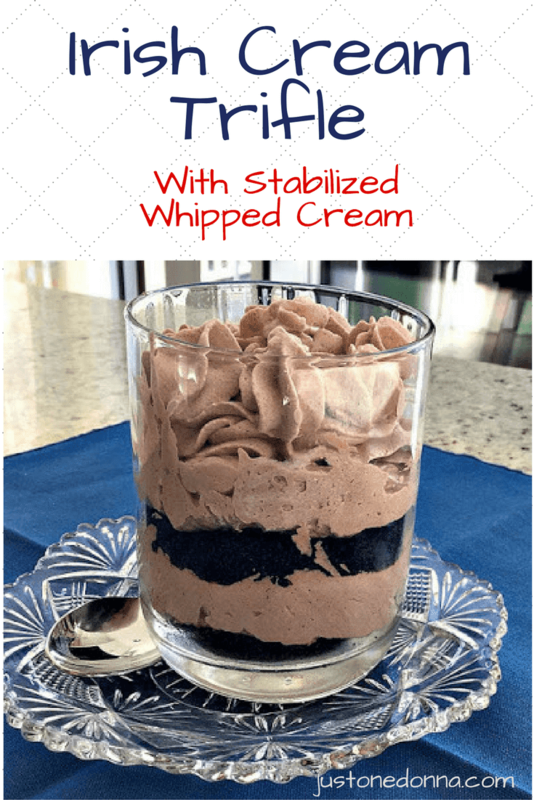 I knew that stabilizing the cream by adding a teaspoon of unflavored gelatin in the whipping process will give the cream additional body that will hold up for hours with no impact on the flavor. This recipe will show you how to make stabilized whipped cream if you've never made it before. To make the cookie layer: Use a food processor or blender to crumble the Oreos. Set aside. 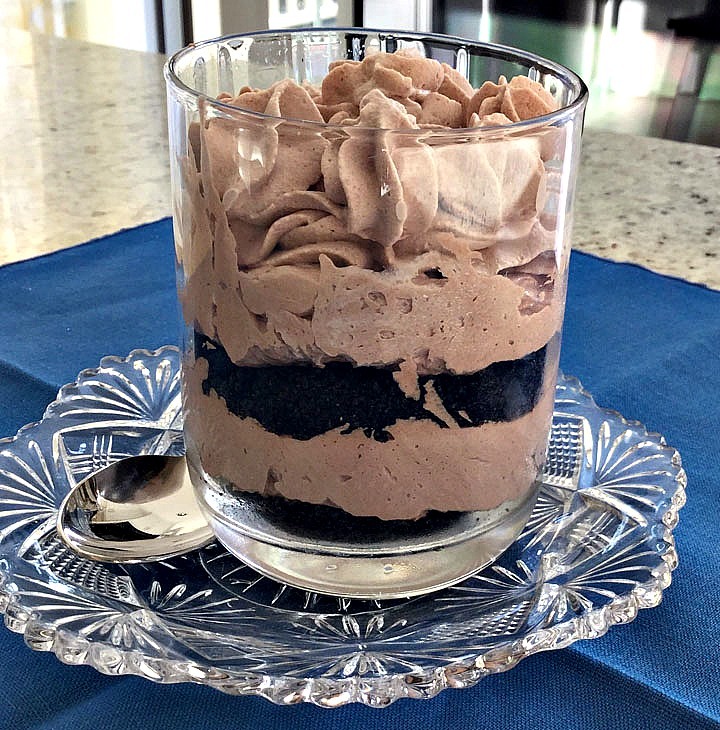 To make the cheesecake mousse layer: Mix together the sugar and cocoa powder in a small bowl until well combined. Beat the cream cheese, sugar mixture and Irish Cream liqueur with a mixer until light and fluffy. Fold in the Cool Whip. To make the stabilized whipped cream: Sprinkle the gelatin over the cream in the bowl of your mixer. Let it sit for a minute or two. Meanwhile, stir the confectioner's sugar and cocoa powder together until well combined. Begin beating the cream mixture, adding the sugar and cocoa a little at a time. Add the Irish Cream liqueur and continue beating until the mixture is stiff. To assemble the trifle: Alternate layers of cookies and mousse beginning with the cookies. Top with the whipped cream. Chill until served. Shared on Meal Plan Monday and Metamorphosis Monday.